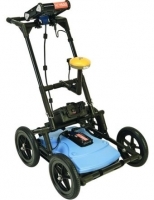 RD1500 Ground Penetrating Radar is Radiodetection's flagship GPR for utility locating. The RD1500 provides all the great features of the RD1100 and also offers Depth Slices as well as Line Views. These allow the user to review slices of the subsurface at different depths, displaying cables, pipes and other utilities in unprecedented clarity. The RD1500 features internal GPS, on-board Wi-Fi, a high resolution touch screen as well as the proprietary FrequenSee™ technology which selectively enhances small/shallow, medium size/depth, or large/deep targets, or even all at once, for easier viewing and detection. Mini reports can be generated and delivered directly from the survey site by connecting to a Wi-Fi network or by using a cell phone as a hotspot. Data can also be exported to a USB memory stick.